From the award-winning developers at Arkane® Studios comes Dishonored: Death of the Outsider, the next standalone adventure in the critically-acclaimed Dishonored series. Be a badass supernatural assassin and take on the role of notorious Billie Lurk as she reunites with her mentor Daud in order to pull off the greatest assassination ever conceived. Building upon Dishonored 2’s signature gameplay and art style, Death of the Outsider features all the series hallmarks, including brutal combat systems, unique level design, and immersive storytelling that responds to your every choice. 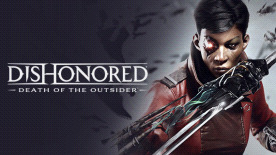 Two months after the events of Dishonored 2, Billie Lurke is on a mission to rid the world of the supernatural being known as The Outsider and will stop at nothing until this he has been defeated once and for all. Dishonored Death Of The Outsider centres around Billie Lurke who first appeared in ‘The Knife Of Dunwall’ DLC for the first Dishonored game. Now in her own standalone expansion she is after the man who changed Corvo Attano and Emily Kaldwin's lives forever by giving them supernatural powers. Death Of The Outsider will challenge players as they will come face to face with Sisters of the Ocular Order, The Outsider obsessed Eyeless-Gang and brand new Clockwork Soldiers. Use your supernatural abilities to your advantage as Billie is able to use her unique abilities to vanquish her foes completely undetected. Be apart of this epic story as Billie makes the history books by attempting to kill The Outsider. Use a variety of weapons, gadgets and abilities in order to take down your foes. Dishonored Death Of The Outsider gives players the option to replay the game using powers from Dishonored 2, giving you the perfect opportunity to re-play your way.